A newly drafted sewing pattern inspired by a late 30’s-early 1940s brassiere from my personal collection of vintage clothing. It gives a slightly pointed silhouette (but is not a bullet bra), supports without underwires and gives a period bust shape under 30’s & early 40’s style clothing. It is designed for use with woven, non stretch fabrics. The pattern can be lengthened to make a great hot weather top too. PDF (Digital) Pattern: price £6.50 (exchange rates as of Feb.2018 approx. $9 USA, 7.40 EUR, 11.55 Au.) Please note the price is for a single size, it is not a multi-size pattern. You will receive an A2 pdf pattern (16 1/2 x 23 3/8 inches) in your chosen pattern size as well as the 9 page thorough instructions pdf with many photos of a bra in progress. By following the tutorial even less experienced sewers will get good results after a practise bra or two. More advanced sewers can easily adapt the making method to suit themselves. The pattern can be printed full size at a copy shop (USA copy shops should use Arch 3 size paper) or alternatively can easily be tiled on a home printer using the poster option in the free Adobe Acrobat Reader program. Linux users can try PosteRazor for tiling. Or just get in touch with me as I can do a pre-tiled pattern if really needed. Sian of Rebel Angel blog wrote a lovely review about her experience of making this bra. You can read her post and see photos here. E W Lingerie blog has a nice review too. You can see another bra version here by Meadow of Duchess Trading. This bra pattern is not sized the same as commercial bras! (a pdf which can be viewed on-screen or printed) for measuring and finding your Band and Cup size. It is very simple to do. As it isn’t possible for a pattern to be ‘just right’ for every body type and after a trial bra you feel a cup size up or down would be a better fit I will send a replacement pattern at no extra cost. There are no refunds given once a pattern has been emailed so do ask for help with sizing if you are unsure about choosing as it is not a multisize pattern. When ordering it will be helpful if you could also add your actual measurements and modern bra size in the Comment box. 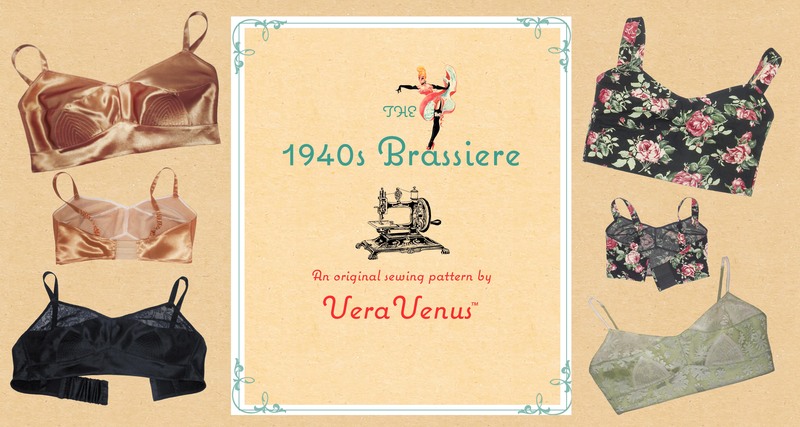 So, if my 1940’s style Brassiere is the pattern you have been looking for just fill in the form below. I’ll then email you a PayPal invoice . Within 24 hours (usually much less) of receiving payment your pattern and the tutorial pdf will be emailed directly to you. If payment is not received within 3 days and no contact has been made from the purchaser, then I will cancel the invoice. * You may be wondering why no instant ordering and download? Read about Vatmoss, the new headache for EU based micro-business pdf sellers.